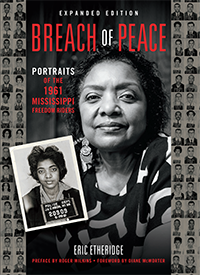 Robert Singleton (above) teaches economics at Loyola Marymount University in Los Angeles, where he lives with his wife, Helen, who was also a Freedom Rider and who is pictured on the cover of Breach of Peace. In 1961 Robert was a graduate student at UCLA and Helen a student at Santa Monica City College. They were arrested on July 30, 1961, at the Jackson train station. Like so many others, my wife and I guarded our optimism during the Obama campaign in fear of another stolen election, the “Bradley effect,” an “October Surprise” — or, worse than all of these — another assassination. But immediately after the announcement that declared Barak Obama our new President-elect, the phone rang nonstop with calls from fellow Freedom Riders, relatives and friends, many of them still shocked or sobbing with disbelief, and all of them declaring this the most incredible moment of their lives. Especially rewarding were calls from our three sons — all grown now — who wanted to share this moment with us and to thank us for taking part in the long and dangerous fight against racism in America. I learned, from several previous inquiries of this kind, to keep a copy of Breach of Peace in my book bag and I circulated it among the students. I told them that I was not much older then than they are now when I decided that I had to do more than simply organize picket lines in sympathy with the student sit-ins and other efforts taking place in the South. The Freedom Rides were the first genuine opportunity to do more than simply talk about the inequity and injustice of racial discrimination and segregation and its effects on all Americans, of all races. It was a chance to join the fray on the front lines. My main disappointment was that far fewer people joined the Freedom Rides than I predicted. I was almost certain that the call by civil rights leaders to “fill the jails” in Jackson, Mississippi, in protest against its Jim Crow laws would be answered by many thousands and supported by many millions. There was little doubt in my mind that we were part of a growing spirit in America that appeared capable of vanquishing the beasts of racism, segregation and discrimination. But a wave of assassinations — of Medgar Evers, John and Bobby Kennedy, Dr. King and Malcolm X — effectively killed that spirit. The election of Barack Obama is the first time I have felt a reawakening of that spirit, but it will grow to its full potential only if we join him on the “front lines” when he calls for the inevitable sacrifices that will be needed to turn our nation around. He will need sufficient time to select his cabinet and develop policies that are designed to reverse the direction we have drifted during the Bush administration. We can only hope that he acts soon, before the spirit dies again. Thank you, Mr. Singleton, for your sacrifice and for reminding us that Obama’s victory is not the “end” of a movement, but a new call to action.